VANCOUVER, Feb. 7, 2019 /CNW/ - Rock Tech Lithium Inc. (the "Company" or "Rock Tech") (TSX-V: RCK; Frankfurt: RJIB) is pleased to announce assay results from a trenching and channel sampling program completed on the McVittie area of its 100%-owned Georgia Lake lithium property in the Thunder Bay Mining District of Northwest Ontario, Canada. The trenching program, following up on the positive results from the Company's Preliminary Economic Assessment announced October 2, 2018, suggests the main McVittie lithium-bearing pegmatite extends further to the north than previously understood. Furthermore, the northern extension exhibits greater width than sections of the pegmatite previously sampled in the south. During the program, a separate lithium-bearing pegmatite to the east was also traced along strike further to the north than previously thought. "These results bode well for future resource definition drilling as they increase the number of potential drill targets," said Martin Stephan, Rock Tech's CEO. 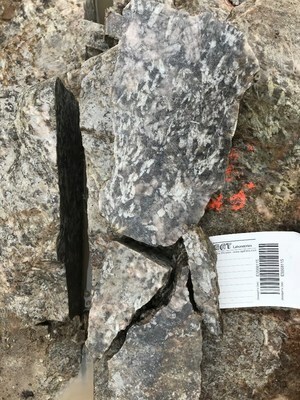 "Increasing the dimensions of the main McVittie lithium-bearing pegmatite, in addition to a separate lithium-bearing pegmatite to the east, supports our hypothesis that the McVittie area could host an additional main resource zone at our Georgia Lake property." "Late last year we completed two channels in the McVittie area that demonstrate the continuation of lithium mineralization to the north and east of the inferred resource defined in the region," said Dirk Harbecke, Rock Tech Lithium's Chairman. "The results will be added to our extensive exploration database and used to formulate near-term drill plans as we begin preparations for a feasibility study." Furthermore, the Company announces that it intends to extend 1,395,000 stock options, due to expire on July 18, 2019 (45,000) and December 20, 2019 (1,350,000), to December 31, 2021. The stock options expiring on July 18, 2019 and December 20, 2019 have an exercise price of $0.93 and $1.50 per share, respectively. The proposed amendment to the stock options does not include any amendment to the exercise price and is subject to the approval of the TSX Venture Exchange.